Offseason U.S. 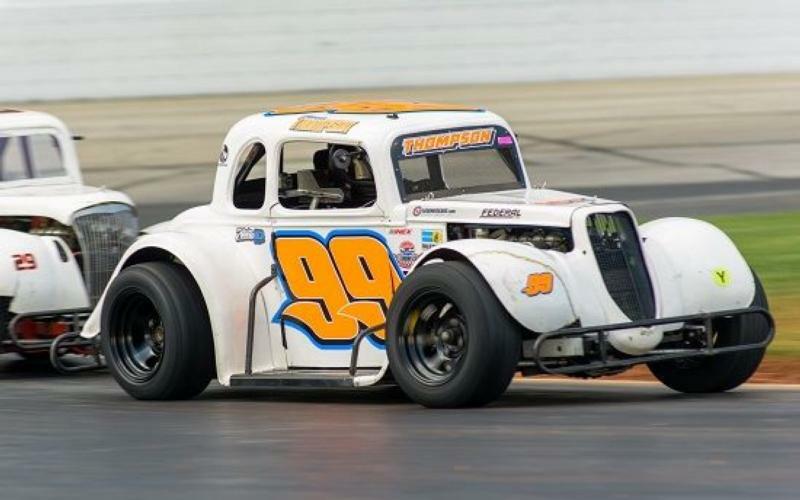 Legends and Bandolero racing resumed at Atlanta Motor Speedway Saturday afternoon, as the Furious Five Series ran double features on the quarter-mile Thunder Ring following last month's rained-out event. With nearly 70 drivers and 16 feature races it was a full day of on-track action, closing out the five-event offseason series. Bailey North dominated the first Rookie Bandoloero feature of the day. North led from the drop of the green flag to earn a trip to victory lane. Matthews Bryson was second while Will Peacock was third to round out the podium. After finishing second in the first feature, Bryson made adjustments and earned the victory in the second feature of the afternoon. Bryson battled North for the lead over the first two laps before pulling away for the victory. North faced mechanical problems midway through the race and finished off the pace. Grayson Groves finished second while Peacock scored his second top-three of the day with another third-place finish. In the first Masters feature of the afternoon, Bill Plemons held off a hard-charging Robbie Woodall over the final three laps to capture the win. Plemons hit lapped traffic with a trio of laps remaining which allowed Woodall to pull up to his bumper. Woodall couldn't use the slow moving cars to his advantage to make a move on Plemons and reluctantly crossed the strip second. Plemons continued his dominance in the second feature of the day. Plemons again started from the pole and comfortably led all 20 laps for the victory. Woodall started on the outside pole and chased Plemons to finish second while Don Maness placed third. Andrew Dollar earned the win in the first Semi-Pro feature of the day. From the point, Dollar led the first 12 laps but a car at the back of the pack spun in turn two on lap 13 and brought out the first caution of the race and bunched up the field. On the ensuing restart, Dollar couldn't hold off the hard charging David Rochester who slipped to the lead past Dollar. The caution flag flew before the field completed a lap forcing another restart and putting Dollar back on the point. Dollar's lead on the restart was short lived. Sammy Smith bumped Dollar and slipped past the leader exiting turn four. Dollar was mired in the middle of the pack for four laps before he fought back and eventually returned the favor to Smith with three laps to go sliding the Johnston, Iowa native out of the way for the lead and win. The second feature followed the same script as the first with Dollar leading the first dozen laps before relinquishing the lead. Lapped traffic held up the leader on lap 12 which allowed Smith to drive around the log-jam and take the lead. Smith got tangled up with Hunter Johnson three laps later opening the door for Dollar to fight back to the front of the pack. Dollar took advantage of a trio of late cautions and outdrove David Rochester over the final two laps for his second win of the day. Kenneth Henderson and Kenny Brady split the Outlaw features with each posting a 1-2 finish on the afternoon. Henderson held off Brady and led from flag to flag to earn the win in the first feature. It looked like Henderson was on his way to a sweep of the afternoon, but a caution flag six laps into the second feature and the ensuing restart opened the door for Brady. The Marietta, Georgia native outraced Henderson down the front stretch on the restart and beat him to the preferred inside line in turn 1 and drove away with win. Jensen Jorgensen swept the pair of Pro Feature races in dominating fashion as he lead 39 of the 40 laps. Jorgensen started on the pole for the first feature and kept the field at bay for the victory. In the second feature, Jorgenson started on the outside pole and it took him one lap to get by pole sitter Rafe Slate for the lead. Once out front, in both races, Jorgenson cruised to the easy wins. Max Brady sat on the pole for both Chargers features and used that momentum to earn a pair of trips to victory lane. Brady, who led all 20 laps in the first feature, led all but two laps in the second feature. Nathan Jackson finished second in both races, but led for two laps in the second feature when he got to the bumper of Brady and moved the Marietta, Ga native out of the way for the lead. It took Brady just two laps to regain the top spot and outpace the field. Clay Thompson wouldn't be denied a pair of wins in the Young Lions Division. Despite a pair of cautions, Thompson dominated the first Young Lions feature. He easily outdrove the field on each subsequent restart for the win. Ryan Rackley and Audrie Ruark finished second and third respectively. It was Rackely who put up a fight in the second feature. He couldn't capitalize on pair of caution restarts to get by Thompson, but was able to keep within striking distance throughout the race. On the final lap, Rackley tried to use the chrome horn to move Thompson aside in turn four, but the Bowersville, Georgia native stood on the brakes and kept the car straight which allowed him to beat Rackley to the line and claim the checkered flag for the win. Gage Roberts rounded out the top three. Kelley Puckett also completed the sweep capturing the the checkered flag in both bandits division races of the afternoon. Puckett started on the outside pole in both races and patiently waited for an opening in both features before making a move. It took five laps in both features for Puckett to get past Carson Ruark for the lead. Puckett drove deep into turn 4 and muscled past Ruark for the lead in the first feature. In the second, Puckett used a caution restart and then drove past Ruark on the backstretch to take the lead. Once on the point, Puckett left no doubt and drove away from the field for the victories. The 2018 Thursday Thunder Legend Series presented by Papa John's Pizza opens its 21st season on Thursday, May 31st at the "Thunder Ring". Infield admission is available for $20, and passes can be purchased at the Security Command building near the speedway's main entrance.